Almost 30 years of collecting and research have gone into this postal history exhibit, including several visits to Iran since 2001 and three longer visits to the National Archives in India (New Delhi, Calcutta and Bombay) between 2004 and 2006. 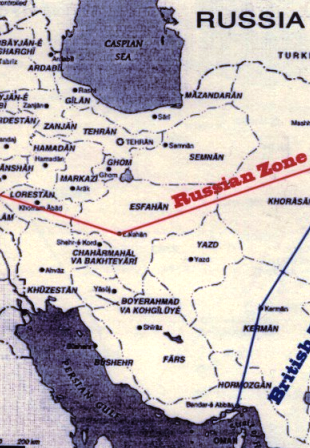 The interests of two Great Powers - Russia and England - collided in Persia, and from the early 1860s to the early 1920s the situation was often very unsettled (political and social chaos from 1901 to 1906, the division of Persia into zones of influence, World War I and German intrusion followed by famine and an extension of the Russian Civil War). All of this combines to make collecting in this area extremely challenging. Russian forwarding mail in Persia, 1860. Said to be the only recorded Tabriz Consular Office, which closed in 1877. Two covers out of three recorded are shown. Combination mail, i.e. Persian and Russian stamps on Persian mail abroad (before 1878). Exchange offices opened for parcels in 1904 at Enzeli, Aschkabad, Bender-Guez and Mechedisser - all are rare, some are unique. Covers showing the establishment of Russian post offices in Gumbad-i-Kabuz and Karassou, 1912/13. Three recorded of Gumbad-i-Kabuz. World War I Russian field post - all rare, some unique examples. British, Turkish and Persian civil, military and Persian opposition groups collaborating with German censors. Some unique, and most very rare. German field post, called "Sondermission P" under Freiherr von der Golts, very rare. The Gilan Movement turned socialist in 1920 with support from the Bolshevik revolution. Some rare. Russian Ship Mail on the Caspian Sea, all rare.